We are glad to inform you that our equity analysts published Hidden Gem - Feb 2012 research report and shared it with all Hidden Gems members. Research report was published last year on 29th Feb 2012. Hidden Gem stock of Feb'12 was Superhouse Ltd and our team recommended buy at price of Rs. 48.20 for target of Rs. 110 in period of 18-24 months. Today, our members are holding Superhouse Ltd with overall profits of 118%. We will suggest our members to do partial profit booking by selling 50% of their holdings in the range of Rs. 105 to 110. Superhouse stock price is closed at Rs. 104.85 today giving absolute returns of 118% to our members within 2 years. There are 10 more Hidden Gems out of 30 published by our equity analysts in last 3 years which gave more than than 100% returns to our members within 12 to 24 months time period. We suggested partial profit booking in many of these stocks and our members en-cashed more than 100% returns and are now holding remaining quantity for free in their portfolio. We also like to share that there are Hidden Gems which gave negative returns but downside was limited. We suggested our members to exit some of these non performing companies like National Plastic, Sumedha Fiscal etc to ensure that they utilize their capital in the most optimum way. We strongly believe that as an smart investor, we should keep on nurturing the best seeds (companies generating free cash flows and utilizing it effectively and rewarding share holders with regular dividends) and erode off the weeds (non performing companies) from our equity portfolio. Below is the summary of Superhouse Ltd recommended by our team under Hidden Gem research report - Feb'12. Superhouse Ltd is a group of several companies engaged in manufacturing and export of finished leather, leather products and textile garments. The parent company, Aminsons Leather Finishers Pvt., was incorporated as private limited company on January 14, 1980. It was converted into a public limited company on December 22, 1984 and its name changed to Aminsons Limited on February 21,1989. In addition, five group companies - Super House Limited, Super Garments Limited, Sharp Leathers Limited, Super Footwear Limited and Allen Shoes Limited - were merged with Aminsons Limited in 1994, 1995 and 1996 as per the orders of the Hon’ble High Court of Judicature, Allahabad. The name of the company was changed to Superhouse Leathers Limited on March 4,1996 and finally Superhouse Limited on November10, 2006 with the approval of the Registrar of Companies, Kanpur (U.P.). From a single tannery in the 1980’s producing finished leather, Superhouse Group has emerged as one of the largest players in the industry. It started with a commitment to excel, achieve and deliver the very best. Towards this end, company engineers, optimizes and controls every phase of the manufacturing process from raw material to finished products to ensure that end products are of the highest quality and also the best value for money for their clients. The Superhouse Group has four overseas companies in the UK, the U.S.A., the U.A.E. and Romania, primarily engaged in marketing and distribution of leather, leather products and textile garments. The Group has crossed an annual turnover of Rs. 4,000 million. The Group has 15 manufacturing units located in Kanpur, Unnao, Agra and Noida. Double Duty is a brand owned by Superhouse Ltd for marketing safety footwear and garments mainly to Gulf countries and European countries. Double duty is the only brand in export market under which we produce safety shoes with Direct Injection PU, PU/TPU, Goodyear welted and Direct vulcanizing process meeting to all international safety norms. * Separate Research and Development Departments for every factory. * Separate Design Centers for Shoes, Bags, and Garments. * Specialized design center in China. * Renowned designers from various countries. * CAD-CAM facilities at shoe factories. * CAD-CAM facilities at fashion garment units. * State-of-the-art laboratories at the tanneries. * R & D and design centers. Net profit of Superhouse rose 30.71% to Rs. 51.5 million in the quarter ended December 2011 as against Rs. 39.4 million during the previous quarter ended December 2010. Sales rose 3.16% to Rs. 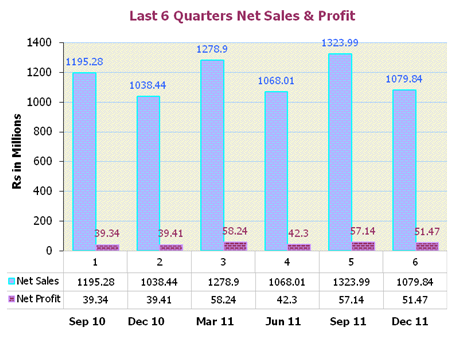 1065.1 million in the quarter ended December 2011 as against Rs. 1032.5 million during the previous quarter ended December 2010. For the audited full year, net profit rose 25.86% to Rs. 171.8 million in the year ended March 2011 as against Rs. 136.5 million during the previous year ended March 2010. Sales rose 24.68% to Rs. 4432 million in the year ended March 2011 as against Rs. 3554.7 million during the previous year ended March 2010. The Government of India had identified the Leather Sector as a focus sector in its Foreign Trade Policy 2004-09 in view of its immense potential for export growth prospects and employment generation. Accordingly, the Government is also implementing various Special Focus Initiatives under the Foreign Trade Policy for the growth of leather sector. With the implementation of various industrial developmental programmes as well as export promotional activities, and keeping in view the past performance, and industry’s inherent strengths, the Indian leather industry aimed to augment the production, thereby enhance export to US$ 7.03 billion by 2013-14, and resultantly create additional employment opportunities for overall one million people. 1. With government plans to focus on leather exports with special initiatives, Indian Leather & Leather goods companies are expected to post good growth in coming years. Superhouse Ltd being one of the major leather export company is expected to achieve double digit growth in sales & profits in next 2 years. 2. Stock is currently trading at a price to earning ratio of 2.5, which makes the stock valuations cheap when compared to its peers. Most of the peer companies PE is in the range of 7 to 18 with lesser top line and bottom line growth, this makes Superhouse a best buy in leather & leather goods segment. 3. As per our estimates, Superhouse can deliver bottom line of 300 million for full financial year 2012 – 13, annualized EPS of Rs. 25.2 with forward P/E ratio of 1.9 X for FY 2012-13, which makes stock of the company an attractive bet at current market price. 4. Company has paid regular dividend from 2006 onwards. The last dividend paid was 15% in last month. Dividend yield at CMP is at 3.1%. 5. On equity of Rs. 114.11 million the estimated annualized EPS works out to Rs. 25.2 and the Book Value per share is Rs. 114.55. At a CMP of Rs. 48.20, stock price to book value is 0.42. The scrip is trading at 19. X FY 2012-13 estimated earnings which make it an attractive buy when compared to its peers. Saral Gyan Team recommends “BUY” for Superhouse Ltd. at current market price of 48.20 for a target of Rs. 110 over a period of 18-24 months. Superhouse Ltd is now 1 of those 11 Hidden Gems which gave more than 100% returns to our subscribers in last 3 years. Team of equity analysts at Saral Gyan put lot of efforts & smart work to identify Hidden Gems (Unexplored Multibagger Small Cap Stocks) and Value Picks (Mid Caps with Plenty of Upside Potential) which not only grow your capital at a healthy rate but also ensures protection of your capital during market downturn. An opportunity missed an opportunity lost. Start building your equity portfolio by investing in Hidden Gems and Value Picks of stock market. Avail discounts upto 40%, freebies and new year suprise gift under our ongoing Merry Christmas - Happy New Year 2014 offer, click here for details. Hurry! Last few hours, offer will disappear on 31st Dec'13 at 11.59 pm.